When General Douglas MacArthur arrived in Australia in March 1942, having successfully left the Philippines to organise a new American army, he vowed, "I shall return!" More than two years later he did return, at the head of a large U.S. army to retake the Philippines from the Japanese. 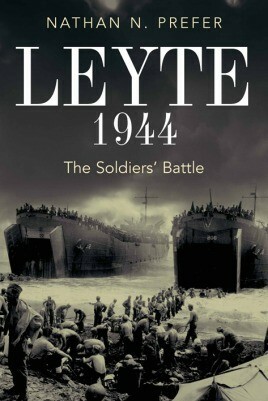 Unfortunately, due to sales rights restrictions, we cannot offer Leyte, 1944 for sale in your country. When General Douglas MacArthur arrived in Australia in March 1942, having successfully left the Philippines to organise a new American army, he vowed, "I shall return!" More than two years later he did return, at the head of a large U.S. army to retake the Philippines from the Japanese. The place of his re-invasion was the central Philippine Island of Leyte. Much has been written about the naval Battle of Leyte Gulf that his return provoked, but almost nothing has been written about the three-month long battle to seize Leyte itself. Originally intending to delay the advancing Americans, the Japanese high command decided to make Leyte the "Decisive Battle" for the western Pacific and rushed crack Imperial Army units from Manchuria, Korea, and Japan itself to halt and then overwhelm the Americans on Leyte. As were most battles in the Pacific, it was a long, bloody, and brutal fight. As did the Japanese, the Americans were forced to rush in reinforcements to compensate for the rapid increase in Japanese forces on Leyte. This unique battle also saw a major Japanese counterattack - not a banzai charge, but a carefully thought-out counteroffensive designed to push the Americans off the island and capture the elusive General MacArthur. Both American and Japanese battalions spent days surrounded by the enemy, often until relieved or overwhelmed. Under General Yamashita’s guidance it also saw a rare deployment of Japanese paratroopers in conjunction with the ground assault offensive. Finally there were more naval and air battles, all designed to protect or cover landing operations of friendly forces. Leyte was a three-dimensional battle, fought with the best both sides had to offer, and did indeed decide the fate of the Philippines in World War II.